It has been very quiet for a while, technically speaking. Not much to report really, until last week that is. 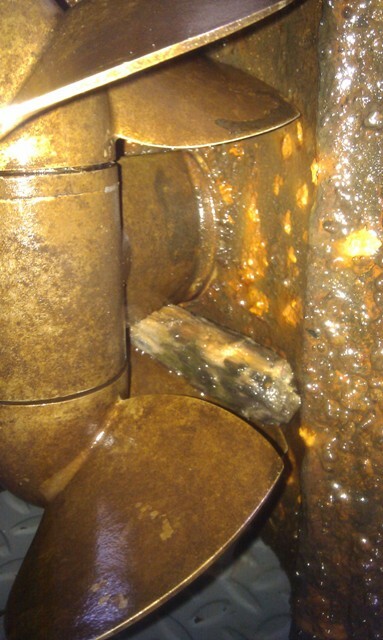 Our engine dumped most of its coolant into the bilge, and the high temperature alarm went off. We had been losing coolant for a couple of months, at a very slow rate. Try as I did, I could not locate this leak – the coolant was evaporating as it escaped, thus was very hard to trace. I just kept topping up the engine header tank with a water / anti-freeze mix, hoping that it would reveal itself eventually. It did, when what would have been a very small hole suddenly turned into a slightly bigger one. 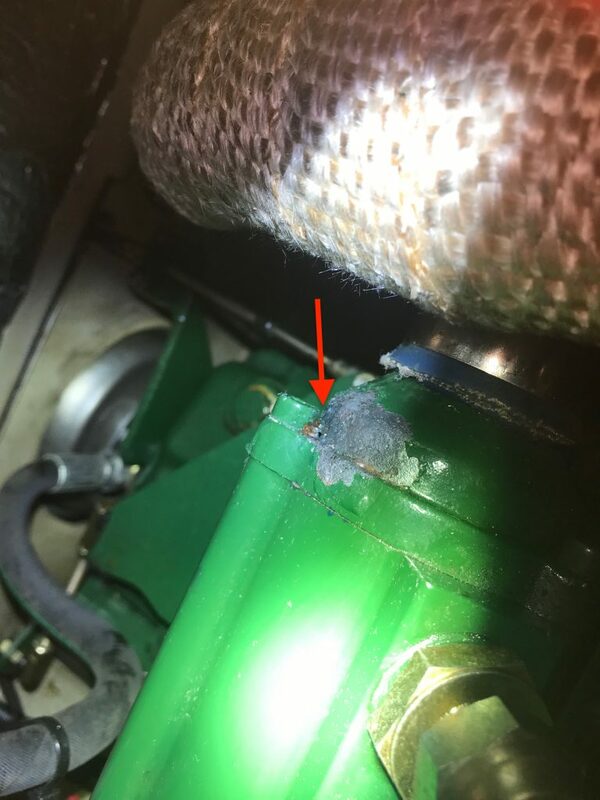 The coolant had been escaping from a hole in one of the gearbox oil cooler end caps (see red arrow). Sneaky, hidden behind one of the screws that hold this end cap to the main body of the gearbox oil cooler (see red arrow). 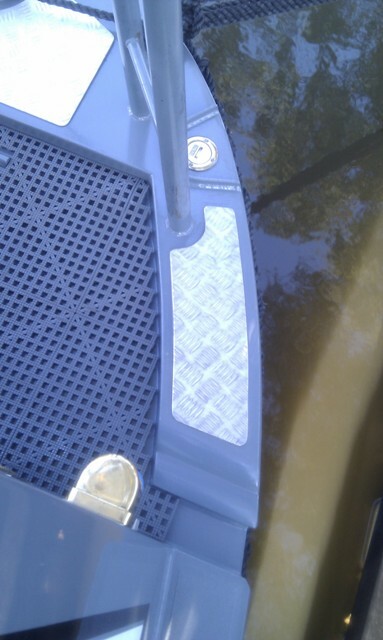 Now fixed, but we are £160 lighter. Beta only supplies complete gearbox oil cooler assemblies, and not just the end caps. If you do end up ordering a new one, I suggest that you take the precaution of double checking the mounting hole size. Our engine was built in 2006, and the gearbox oil cooler to engine mounting holes are M8. Since then, and for reasoning only those nice folks at Beta know, the mounting holes were reduced to M6. We found this out the hard way. In fairness, Beta swapped the new gearbox oil cooler pretty quickly, but we were without an engine for 3-days longer than we needed to be. Good job we have a portable generator as a stand-by! Been busy today replacing our Eberspächer DW5SC heater, so as to be sure that we are ‘toasty’when the winter sets in. Our original unit has served us faithfully for the last 9 years, but it was getting noisy, with the water pump speeding up and slowing down every couple of minutes, and giving cause for concern. Most likely, it was on the verge of packing up completely. I shall admit to this unit having never been serviced since it first saw action in 2006. Leave stuff like this well alone I say. It was not smoking, and it fired up first time every time. Other than checking it now and again to make sure that there was nothing coming adrift ,or showing signs of leakage, or burning, etc., there is not really much you can do to it anyway. The post mortem will be soon, and serviceable parts will be set aside as spares. The new unit was purchased from Heatso, costing us £636, inc VAT, which was a good deal, with other suppliers wanting much more for exactly the same model. Delivery was prompt. Bedroom TV viewing has been resumed. We decided to get a Linsar 22″ LED 3000 HD TV in the end, having spent an another inordinate amount of time searching for a decent flip down. This particular TV comes with Smart functions (via a Wi-Fi dongle that fits one of the two USB ports) and Freeview, and an integral DVD player. Smart TVs that also include a DVD player seem to be few and far between for some reason or other. Connectivity in other respects is pretty good too. We got a good deal from John Lewis. 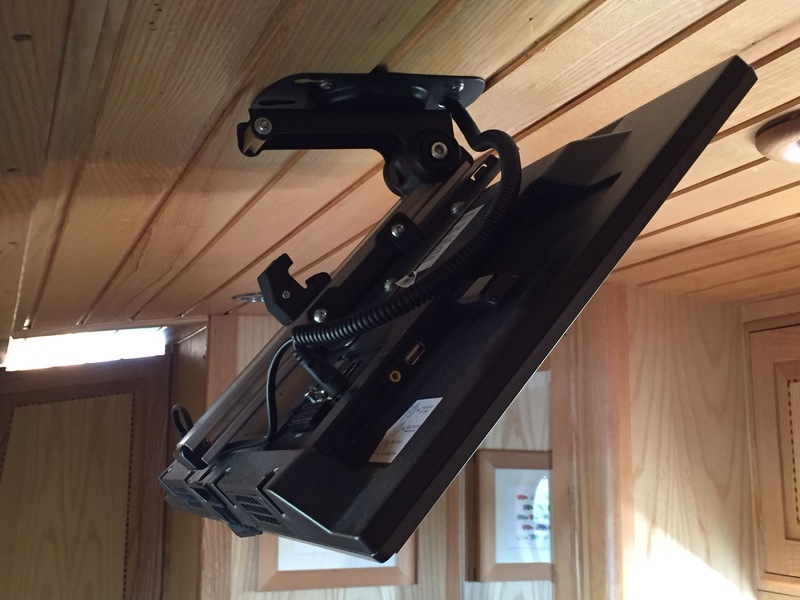 The aerial for digital terrestrial TV and the power lead have been routed up to the cabin roof via some black plastic flexible conduit (hate to see wires dangling), and stashed behind the cabin roof and side wall timbers. The TV is connected wirelessly to BELLEs 4G network, so that we can watch stuff via BBC iPlayer, etc. We have also signed up for a NETFLIX service for a while. Be warned though, you need plenty of data, even for SD, which will eat typically 400Mb to 1Gb per hour of viewing. For those who have not had a smart TV before, make sure that the TV you decide to buy comes with the smart TV services you want, be this Amazon, NETFLIX, or whatever. Most of the TV manufacturers are ‘economical with the truth’ when they offer the Smart function. The picture is excellent, as is the sound quality / volume. We are very pleased with it so far, and the only gripe really is that the hand held remote is the size of a cricket bat! Still, less chance of us misplacing it I suppose. Fingers crossed that this choice works out better than the SOVOS. …. promised a lot, but failed to deliver. 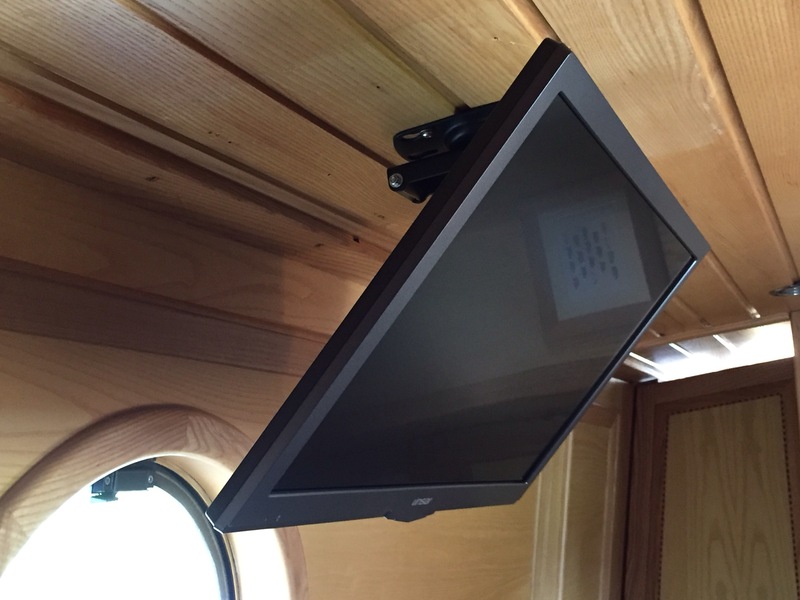 Just under a couple of years ago we purchased a new SOVOS 15″ flip down TV for our bedroom on BELLE. It was purchased via Maplin. A sensible decision we thought, even though priced at well over £300. 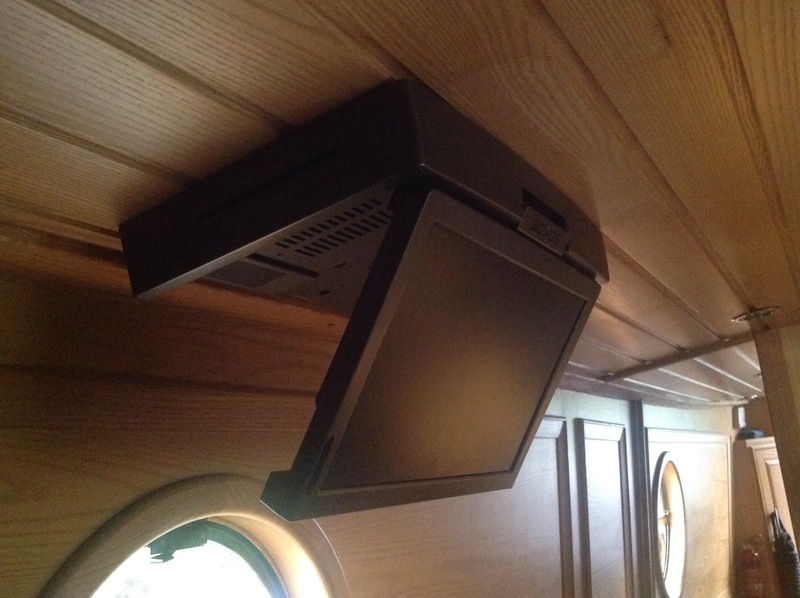 To us, it amounted to a very tidy and elegant flip down TV product, and it incorporated a DVD player and a lot of I/O connectivity. Now for the bad news. The TV and DVD player have both now packed up completely. For the record, the unit was replaced three times during the warranty period owing to screen issues. You can bet your life that the replacement will not be another SOVOS product. Shame really because outwardly it is a very tidy and robust package that is well configured for use in a confined space. Still, that’s not much use if you cannot watch it! Having Googled for what seems like hours on end to find another suitable non-SOVOS flip down TV we are struggling. So, me thinks that we shall opt for a well known brand of flat LED TV, and this will be mounted to the cabin roof with a suitable proprietary bracket. Ideally the replacement will have an integrated DVD, but this is no longer essential from our point of view, owing to our increasing use of iTunes for movies, and iPlayer, etc. via our on-board 4G network. Watch this space. 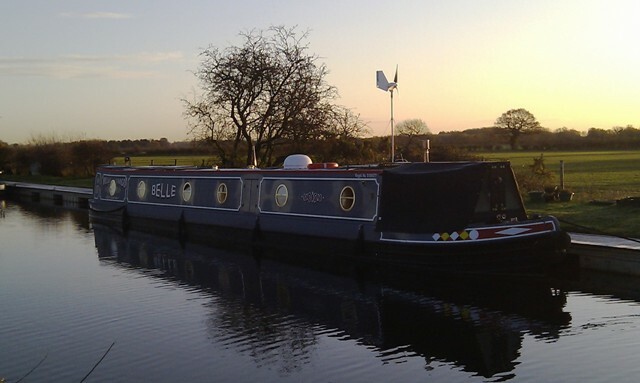 When BELLE first went into the water she was fitted with 5-off 110Ah ‘Multicell AGM Dual Purpose’ batteries for the domestics. We do not have an electrical shore supply, so these batteries were hammered, and they were subjected to daily discharge / charge cycles. Their performance was perfectly OK for 4 years, started to deteriorate at the beginning of the 5th year, and they needed replacing at the end of that year. In view of this performance, I was minded to fit more of the same, but I could not get another 5-off at short notice. In a rush, I ended up getting 5-off 110Ah ‘NUMAX Sealed Lead-Acid’ batteries instead, expecting that they would last at least 2-3 years. They set me back a few quid shy of £500 around Christmas time 2011. Alas, this was not to be, because they started to show signs of deterioration after 6 months use and they needed replacing after about 10 months! Needless to say they have been replaced by another set of Multicell AGM’s! This latest set are actually 125Ah (in the same case size) and they cost me a few quid shy of £800, but they still represent the cost-effective solution. 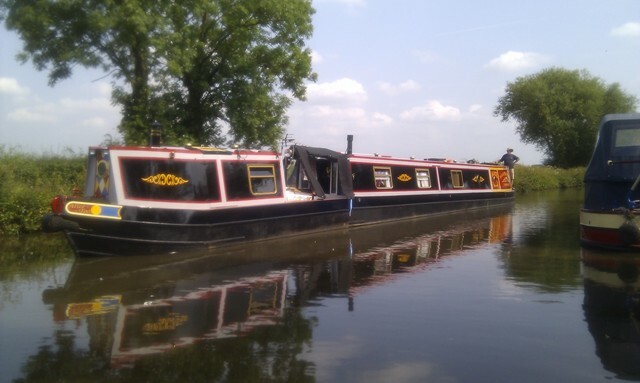 …..are definitely getting to me, and many others apparently, according to the boating media. I was wondering, do you think that a sign like this might slow a few down? It might work with some folks, but there will always be the certifable *uckwit boater that would raz past regardless. As for the latter, take note; I am working on a readily deployable adaptation of a police ‘stinger’! After a fair bit of research we decided in the end to purchase an Ampair 300 wind turbine and Ampair Voyager VS-50 regulator. The wind turbine has now been installed on our mooring and the regulator has been installed in BELLE’s stern, leaving us the option to mount the wind turbine on board BELLE at some later date. The system was fired-up at dawn on Monday this week and everything seems to be working OK – performance thus far is impressive. Noise and Vibration – Having had brief discussions with a number of boaters that have passed us over the last few months with a wind turbine stowed on their roof, we established that a wind turbine is best located at the stern, where it can be mounted securely to the rear bulkhead and/or the counter. The boat structure is much stiffer here and this helps keep the noise and vibration down. 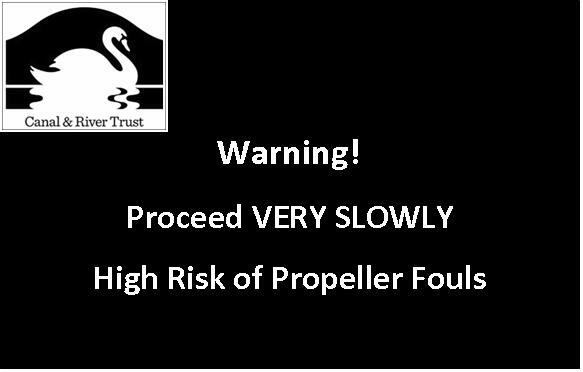 However, noise and vibration is still evident on board in a stiff breeze, so it makes more sense to ground mount the wind turbine whilst on your home mooring when seeking a quiet life. Charging Control – The Ampair VS-50 regulator is effectively two regulators in one, i.e. 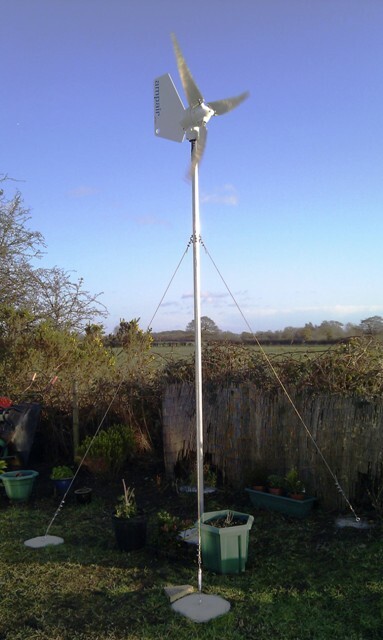 one to manage a wind turbine output of up to 25 amps and the other to manage a solar panel output of up to 25 amps. There are other regulators available from Ampair and their competitors, but we opted for this one because it has been designed specifically with the Ampair 300 wind turbine in mind. For sure, these items of Ampair equipment cost significantly more than those available from Ampair’s competitors, but you do not need to look very hard at all when comparing designs to quickly realise that these Ampair products are definitely built to last a long time in a marine environment. The wind turbine mast has been made from a 3.0 metre long section of 48mm OD aluminium ‘standard’ scaffold tube – this mounts into a steel ground socket that has been cast into a small block of concrete. The guy lines and fittings are stainless steel – the lines are connected at the ground end to eye bolts that have also been cast into small blocks of concrete. The electrical output from the wind turbine is delivered to BELLE via a flexible cable assembly that connects via a new waterproof plug and socket arrangement on the stern. A waterproof plug and socket has also been incorporated into this flexible cable assembly at the base of the mast. Therefore, a much shorter flexible cable assembly can be substituted when the mast is mounted on BELLE’s stern in due course. 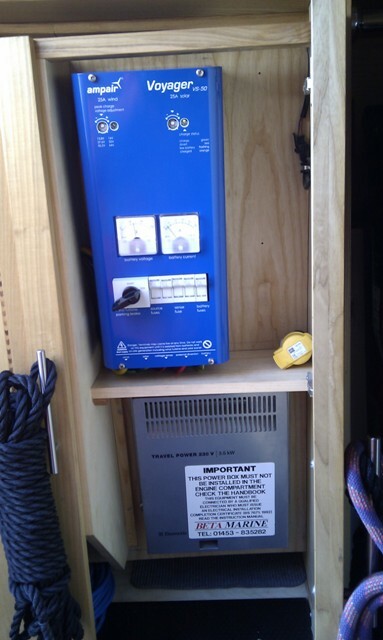 The regulator has been mounted into an existing electrical equipment cupboard in BELLE’s stern. This regulator is quite large when compared to competitor products and achieving a tidy installation was a bit of a challenge. This regulator is built like the proverbial ‘brick sh1t house’ – built to last. Those wanting to learn more can mail me. When BELLE was first built she had sand applied to most of the ‘walked on’ painted surfaces whilst the paint was still wet – the intention in this respect was to create some ‘slip resistance’ and in so doing lessen the risk of one ending up in the cut and / or bashing or impaling ones anatomy onto something undesirable, etc. 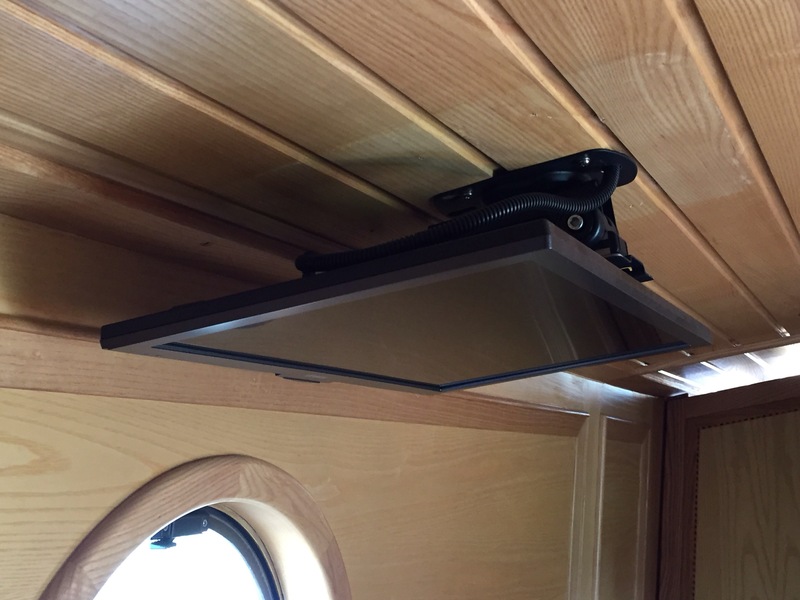 In BELLE’s case, sanded surfaces featured along the tops of the gunwales, around the edge of the counter and most of the cabin roof. This is a common approach and pretty much every boat you see on the cut will have some walked on surfaces sanded. Unfortunately, regularly standing on these sanded surfaces and weathering, etc. erodes them and it does not take very long for some of the more frequently walked on surfaces to erode to the extent that their slip-resistance is compromised. Additionally, the underlying steel is exposed and this starts to rust and things get, well, unsightly. Reaching this stage took about 4 years around BELLE’s counter and the tops of the gunwales at the bow end. The roof and the gunwale tops elsewhere are still OK, but this really has more to do with their relatively infrequent use. The roof and gunwale tops have been re-painted once since first build. There are alternatives, e.g. applying rubber treaded sheet and dri-deck matting , etc., but it is not practical / economical to apply these everywhere. Folks that wish to ‘tread carefully’ might be interested in our latest modification to BELLE, i.e. we have fitted aluminium tread plate to those areas that are used most frequently. This picture shows one of the tread plates that we have shaped and then mounted to the counter. Two coats of zinc phosphate primer have been applied to the underside surface of each tread plate and then they have been ‘bonded’ into place using 2-part epoxy glue. This avoided a need to drill holes through the top walls of the diesel fuel tanks and/or any having to weld on any mounting features. They are certainly securely fixed. We anticipate that the application of the zinc phosphate primer, in conjunction with the painting of the top wall of the tank, will avoid any electrolytic corrosion between the aluminium plate and the steel tank – time will tell of course. We have also fitted some shaped aluminium tread plates to the top surfaces of the gunwales at the bow, but in this case the plates have been fixed in place using stainless steel countersunk head fasteners. We have also fitted aluminium tread plate to the upper surface of the step at the stern doorway because this gets hammered as well. We elected to use aluminium instead of steel because steel would need painting and this paint would inevitably chip off with use, thus allowing the steel to rust. Whilst aluminium does corrode, the process is effectively halted once the first layer of oxide has formed on the surface – it does not look so unsightly either. All in all, once you have obtained the materials, it’s an easy job to carry out yourself, or if you are having a boat built, your boat builder should have no trouble incorporating similar tread plates (at a price of course). I recommend that you use the relatively slower curing 2-part epoxy glue so as to allow some re-positioning during installation. Get in touch if you want to learn some more. ……. can be caused by things like this, i.e. 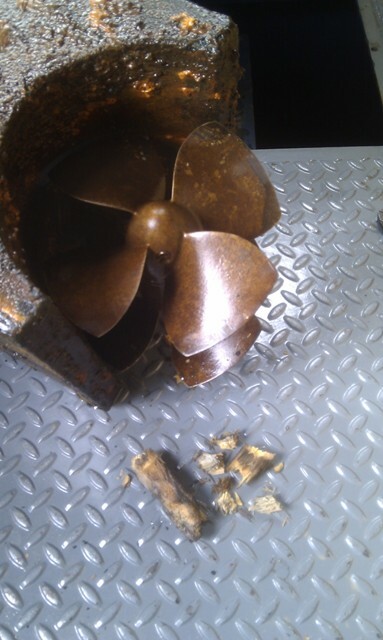 a chunk of wood that managed to find its way through the grilles on the ends of our bow thruster tube and lodge itself between the propeller and the propeller housing. Unfortunately, no amount of rapid port-starboard thrusting was going to shift it. Within an hour though, the thruster had been removed, cleared and re-installed. This was almost as easy as exposing the main propeller via the stern weed hatch. In our case however, the entire thruster, complete with propeller can be removed whilst afloat so there was no need for an expensive dry dock! This might serve as a timely reminder to folks having a bow thruster installed as part of a new boat build (or having one retro-fitted), i.e. they might want to quiz their boat builder about how their bow thruster will be readily cleared and/or repaired? I thought that my eyes were deceiving me earlier today when I spotted what I thought to be a ‘bent’ boat approaching us. Most boats ‘sheer’ from bow to stern in a uniform manner, but this one had two sheer angles, giving the appearance of it being ‘bent’ part way along its length. 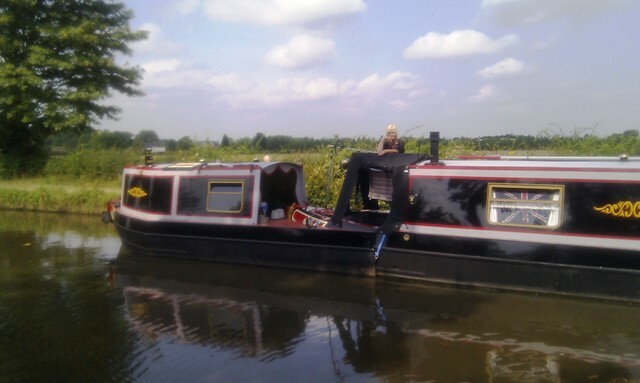 It was not until it was much closer did I realise that this boat; Alice was effectively two boats in one. Alice’s bow section can be separated from her main section, leaving the latter to be operated independently if so desired. The owner explained to me that the bow section could be a workshop, office, or extra berth, etc. I thought that this was an excellent innovation – allowing, for example, the shorter locks in the network to be navigated whilst still effectively providing 70′ worth of boat. Steering Alice would surely be much easier than steering a craft whilst towing in the usual manner. I cannot recall seeing an arrangement like this before. I expect that there will be more examples to be seen on the water as the idea catches on though. If I had my way, all Spammers would be put to death!